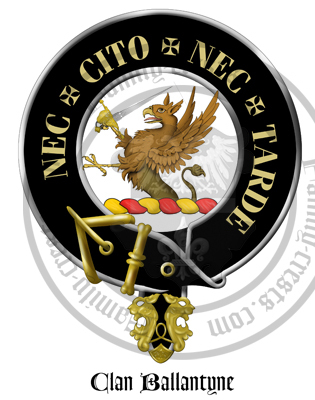 Clan Badge: A demi griffin, in the dexter paw a sword erect all proper. The name is interchangable with the alternative apelling of Ballantyne, and often the two spellings are found in the same generation. The name is thought to derive from the lands of Bellenden in Selkirk. The lands of Glenmaddy, on the south bank of the Euchan Water in Nithsdale becmae Bannatyne possession in the fifteenth century. Roland Bannatyne of Glenmaddy also gained lands in the barony of Sanquhar in 1548, the grant was witnessed by a John Bannatyne of Cog. In 1557, this same John Bannatyne of Cog forfeited his lands in 1557 when he became a fugitive from the law.During the Plague of 1568 in Edinburgh, George Bannatyne, a compiler of poetry, born in 1545, collected together a set of works at Bannatyne House. Sir Walter Scott deemed this collection so important, that he named his literary club after him in 1823. The Bannatyne club published George's work along with a number of previously inacessible works.James Bannatyne was made a judge in February 1626, and took the title 'Lord Newtyle'.The Bannatynes of Kames are shown to have possessed their lands and the Castle of Kames since the fourteenth century, originally a single defensive tower was later developed by Sir William Bannatyne into a large country house. He later became Lord Bannatyne, who as a judge and lawyer associated himself with the intellectual circles in Edinburgh. He died in 1833.The Ballantynes of Peebles became very important in the Scottish wool trade in the Eighteenth century, and were fundamental in the development of the Scottish tweed trade in 1829. Arms: Quarterly, 1st and 4th, gules, a chevron argent between three mullets or (for Bannatyne); 2nd and 3rd, azure, a castle triple towered argent, masoned sable, windows and portcullis shut gules, in dexter chief a mullet or (for Macleod). Crest: A demi griffin, in the dexter paw a sword erect all proper. Supporters: (Barons of Sanquhar only) Two angels proper, habited azure and winged or.